June 6, 2012  According to reports collected by the central bank, the economic outlook remains "positive." That's more upbeat than the kinds of things many economists have been saying in recent days. June 6, 2012  Policymakers at the central bank aren't convinced that things have gotten significantly worse recently. 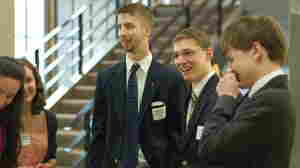 May 11, 2012  At the High School Fed Challenge, students compete to see who does the best impression of a central banker. May 8, 2012  If you're a high school student and you dream of holding the U.S. economy in the palm of your hand — if you want the power to control interest rates and to print money out of thin air — the Fed Challenge is for you. 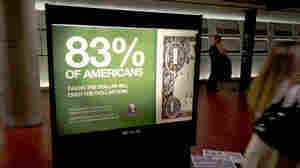 April 20, 2012  Should we kill the dollar bill? On today's show we go deep into the nature of money itself, and we find a clear answer to this question. March 13, 2012  The decision was widely expected. Stocks, which had been on the rise before the news, remain higher. 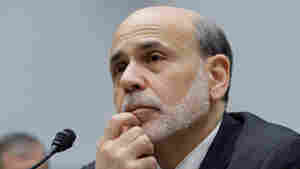 Will Fed Chairman Bernanke Be Right This Time? February 29, 2012  Five years ago on the last day of February, he told Congress the economy's fundamentals were strong. On this last day of February 2012, he predicted that inflation will remain in check. 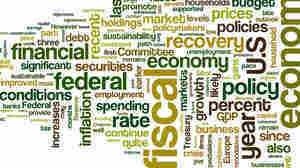 January 11, 2012  The language in the central bank's "beige book" look at the economy has gotten more upbeat. It sees "modest to moderate" growth. December 13, 2011  Policymakers expect unemployment will continue to gradually decline and that inflation will remain in check.